December 4: Congratulations to the top Phalene male and female of the year! As mentioned below it was clear already after the Herning international show that DKCH SECH NOCH NORDCH INTCH KBHV09 DKV09 DKKV09 KLBV09 KLBCH Blicci's Energetic is the top phalene male of the year. 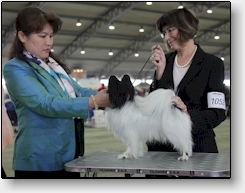 After the last club show on Dec. 4, the ranking for the females was ready too: The winner is DKCH SECH Zenitzia's Blonde Ambition, owned and bred by Kristine Kjølner from Sweden. 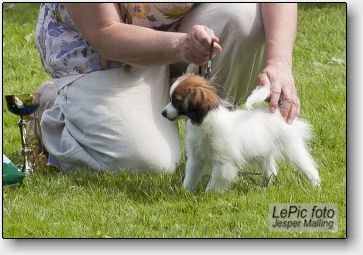 "Bimbo" is a grandchild of DKCH SECH EUUV05 KLBV05 KLBV06 KBHV06 KLBCH Blicci's Blue Bayou, so we are very proud of her too! A split runner-up top female is Jet's litter sister Blicci's Every Little Thing. Congratulations to the owners of all winners! DKCH SECH FICH NORDCH INTCH KLBCH DKKV06 Blicci’s U Are My Universe is no longer here. Chip died tragically today after a vet examination. He had sadly developed a perineal hernia and we brought him to a specialist vet hospital to have him examined in preparation for a surgery soonest possible. A few hours after we came home with Chip, he went into cramps and we rushed back to the hospital with him. He died on the way, from an internal bleeding. We don’t blame the hospital. Chip’s condition was apparently more serious than we thought. Until that moment, Chip had been his usual cheerful little self, in spite of his condition which developed quickly. Eight years of happiness, so much love, so much fun, so much to be grateful for. Who would know that his life would end so suddenly. Chip will live in our hearts forever. 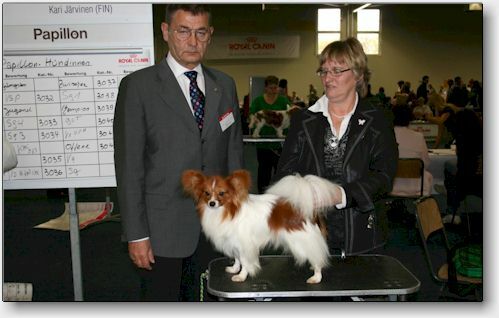 After the year's last international show, it is now clear that DKCH SECH NOCH NORDCH INTCH KBHV09 DKV09 DKKV09 KLBV09 KLBCH Blicci's Energetic can add two more titles to his name: Danish Kennel Club Breed Winner 2010 (top winning phalene, male or female, at the Danish Kennel Club international shows of the year) and Danish Club Winner 2010 (top winning phalene male, all shows of the year). Both titles for the second year in succession, and this year after only being shown from January to June. After this, Jet travelled back to the US with his owner Elisa Kamens. October 2, Faroe Islands: Nice win for "Bob"
In the summer of 2009, phalene puppy Blicci's Garibaldi aka Bob travelled with his new family to Torshavn to be the first phalene in the Faroe islands. Bob has settled well and enjoys life there. His owner Majbritt thought it could be interesting to show him at the year's one and only National all breed show in the Faroe islands. 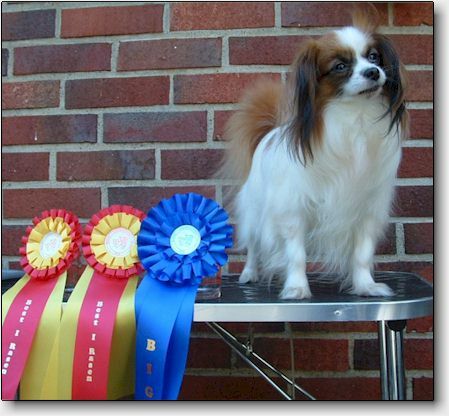 Majbritt has been attending handling classes with Bob and the hard work paid off, since Bob showed like a charm and took CAC and Best of Breed as we had hoped for. And as if this was not enough, he finished his day going Best of Group-3! 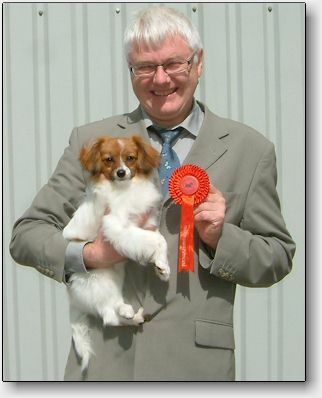 Thanks to Mr. Gert Christensen who judged all 65 dogs of this show. Bob's parents are MultiCh Kecil Jammin' The Blues and DKCH Blicci's Color My Dreams. 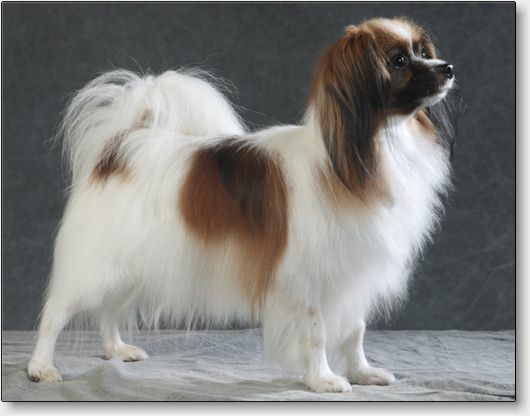 Kecil Wait Your Chance had her show debut at the Copenhagen Winner Show. She enjoyed all her day and made us proud: Best Puppy in Breed. Thanks to judge Chie Ejima from Japan. September 16, USA: Go, Harry! 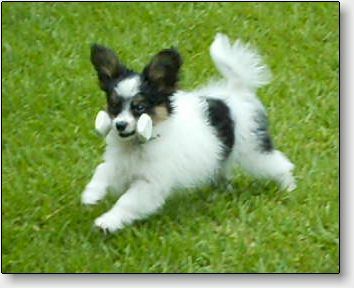 So here he is, Blicci's Harry Boy, a smashing 12 weeks old puppy captured on the run by his happy new owner, Anne Carmichael, Mayan Papillons in New Orleans. Anne came here to pick up her puppy and he has settled in the most wonderful way, taking a very active part of Anne and Henry's everyday life in the "city of Jazz!". Thank you for giving him such a great home! Harry is out of Blicci's Floradora's first litter, sired by Ponda's Uncle Unicum. Harry will be co-owned by Jane and we look forward to seeing him in the rings next year. A happy owner, Lina Jansson could celebrate the first CAC for her phalene boy Blicci's Gold Nugget aka Mackan, at the international show at Sofiero, Sweden. The judge was Kitty Sjong from Denmark. Big congratulations! Macken is after MultiCh Kecil Jammin' The Blues and DKCH Blicci's Color My Dreams. August 15, USA: Jet has a new career! DKCH SECH NOCH NORDCH INTCH KBHV09 DKV09 DKKV09 KLBV09 KLBCH Blicci's Energetic made a smashing start of his American show career by taking a 5 point major and Best of Winners yesterday in Harrisburg, Pennsylvania. The judge was Dorothy Martin. Congratulations to his happy owner and handler Elisa Kamens! Blicci's Golden Universe enjoys summer with his owner Bärbel Lieblich. They had a another nice show day in Neussen where Max got the title Verbandsjugendsieger. This title is only given once a year. July 7, Denmark: The Winner Takes it All! Kecil Winner Takes It All lived well up to his name by going Best Phalene in an entry of 7 phalenes, all older than him, and BIS-2 in an entry of 45 at the Vilhelmsborg match show, judged by Kim Bay. This smashing little puppy is bred by Lise Verburg and owned by Marianne Hansen and we look very much forward to following him growing up, since he is a son of Jet and litter brother to our Amy. We enjoyed an exciting weekend with nice wins for our dogs. 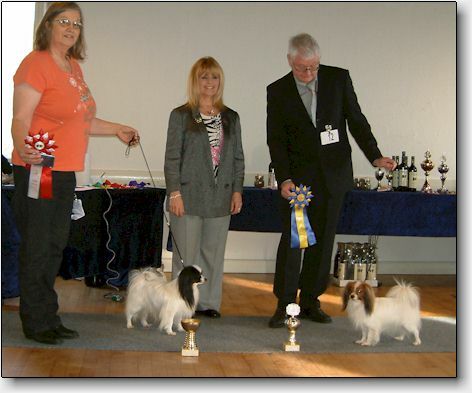 DKCH SECH NOCH NORDCH INTCH KBHV09 DKV09 DKKV09 KLBV09 KLBCH Blicci's Energetic went 2nd best champion male at the WDS on Saturday and finished his year in Denmark with a bang going best male, BOB and BIS-2 at the Specialty Show on Sunday. Our sincere thanks to judge Ms. Margo E. Klingler from the US. The next day, Jet travelled with his owner Elisa Kamens back to the US and we wish them all the best in the future. 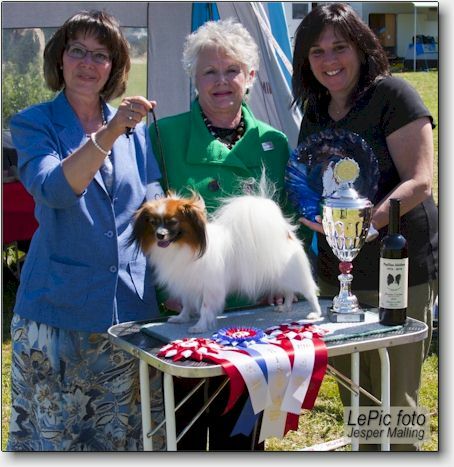 Blicci's Golden Universe, owned by Bärbel Lieblich, went Best male-2 with CAC on Sunday. His first CAC in Denmark and we look forward to seeing him back here for more! The weekend before the WDS, Max finished his German Youth champion title and Landesjugendsieger title. 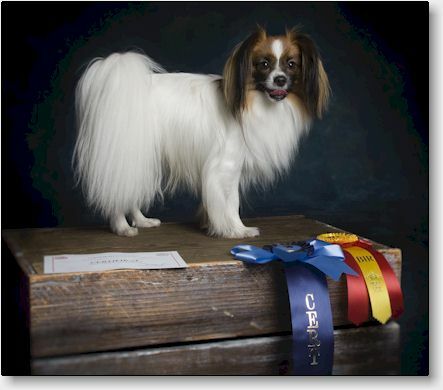 June 19, Poland: Jet is now International champion! DKCH SECH NOCH NORDCH KBHV09 DKV09 DKKV09 KLBV09 KLBCH Blicci's Energetic can now add International Champion to his titles! One year and five days after his first CACIB in Denmark, he took the CACIB and completed his title today at the international show in Stettin, Poland. Big thanks to Marianne Hansen and Lars Kalkerup for bringing him and showing him there. Well done! The judge was Mr. Laurent Pichard from France. 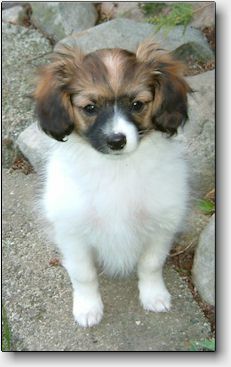 June 1, Denmark: Welcome to "Amy"
A dream came true when we could welcome little Amy in our house. Amy is Kecil Wait Your Chance, sired by DKCH SECH NOCH NORDCH KBHV09 DKV09 DKKV09 KLBV09 KLBCH Blicci's Energetic out of Kecil Vanity Fair, and we had been looking forward to seeing the outcome of this combination ever since we first talked about the possibility with Amy's breeder Lise Verburg. Four lovely puppies were born on March 10 and we are pleased and proud to own the one female of the litter. Amy will have her own page in our gallery soon. 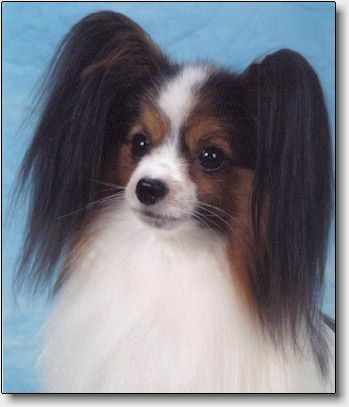 It's a historical day today, because the first papillon passed an official mental description in Denmark. This test was earlier referred to as a character test. 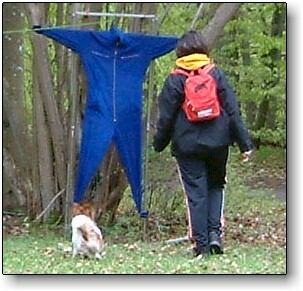 It contains elements like contact with a stranger, willingness to play, chasing, ability to relax, reaction to the sudden appearance of a large object (blue overall), reaction to sounds (rattling sound of a chain), reaction to an approaching threat (ghosts), reaction to shots, and not the least, the ability to wind down. 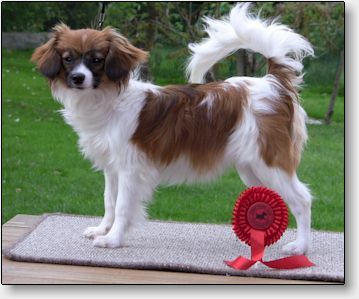 It was our little Blicci's Framboise aka Rikke, 20 months. She met all the challenges with a lion's heart and was as happy as always after the test. Well done, brave little girl! BOB, best male, CACIB, Crufts qualified 2011: DKCH SECH NOCH NORDCH KBHV09 DKV09 DKKV09 KLBV09 Blicci's Energetic, owned by Elisa Kamens. 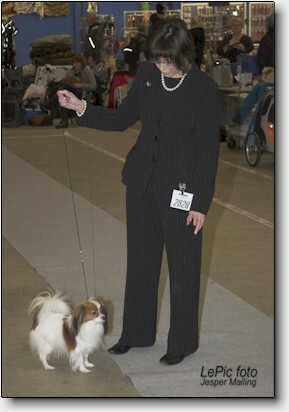 BOS, best female, CACIB, Crufts qualified 2011: DKCH Blicci's Every Little Thing, owned by Susanne Rasmussen. 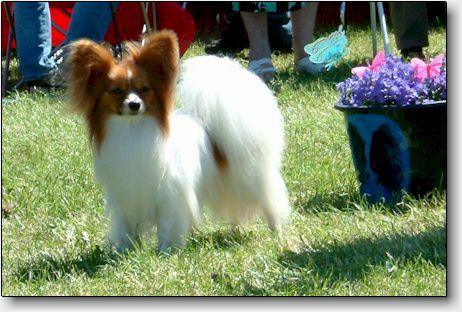 At the Norsk Miniatyr hundklubbs shows in Nærbø, DKCH Blicci's Diamonds R Forever took BOB both days and Best of Group 2 on Sunday. Big congratulations to her owners Anne-Lise Helleren og Vidar Skjerahaug! This year it feels like the winter will never end! The snow is high and the dogs love it. They play and sometimes even don't want to come in from the garden, but we feel at little fed up with winter now, to say the least! 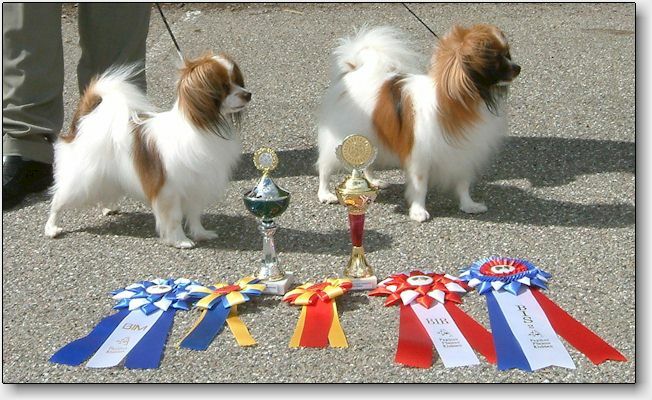 We long for spring and summer and all the activities, like the World Dog Show in Herning, Denmark on June 25-27. 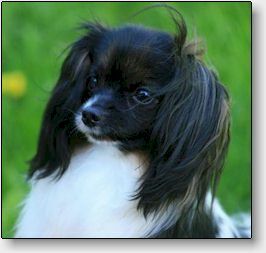 Among other good things, we are pleased with our two new hopes, Blicci's Go Lightly (phalene) and Blicci's Gwen Stefani (papillon). The two girls will soon have their own pages in our gallery. 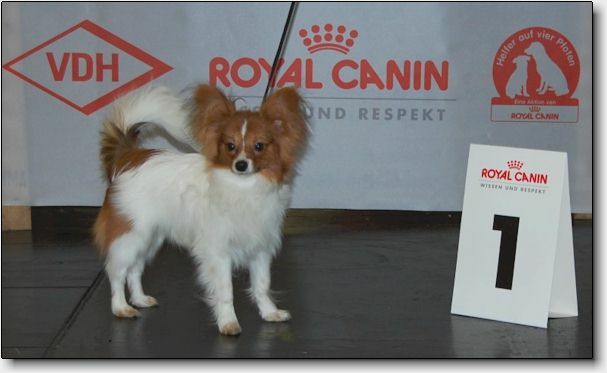 Blicci littermates go BOB and BOS phalene and we have a new Danish champion! BOB, best male, CACIB: DKCH SECH NOCH NORDCH KBHV09 DKV09 DKKV09 KLBV09 Blicci's Energetic, owned by Elisa Kamens. 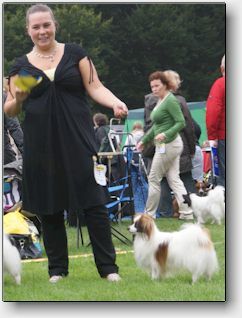 BOS, best female, CACIB, CAC and New Danish champion: Blicci's Every Little Thing, owned by Susanne Rasmussen. 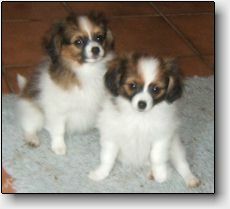 Congratulations to the lucky owners of these two great little individuals! Always happy and well balanced, like all of this family. 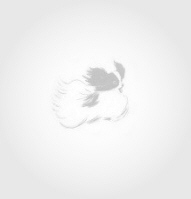 DKCH Blicci's Every Little Thing has her own page in our gallery now. 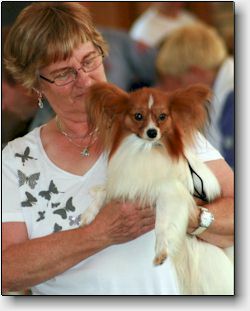 The Papillon-Phalene Clubs specialty show i Vetterslev-Høm featured a judge we had been looking forward to: Irene Robb from England's top kennel Gleniren. 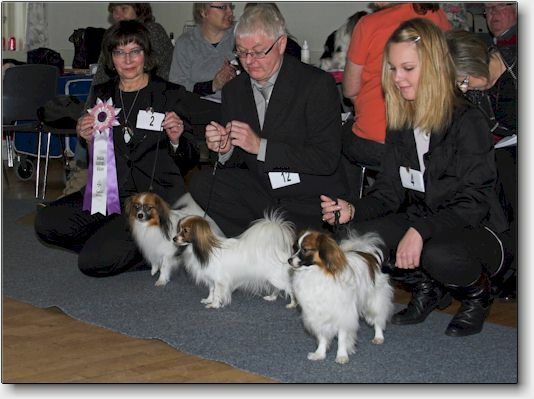 We were very pleased to see our little phalene female Blicci's Every Little Thing, owned by Susanne Rasmussen, go best female in breed. She also took her second CAC. Every Little Thing is the litter sister of MultiCh Blicci's Energetic. 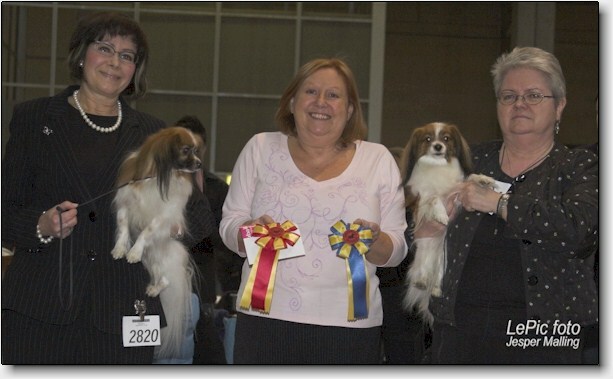 As the icing of the cake, Irene Robb had a special prize for the Best in Show Breeder's Group. 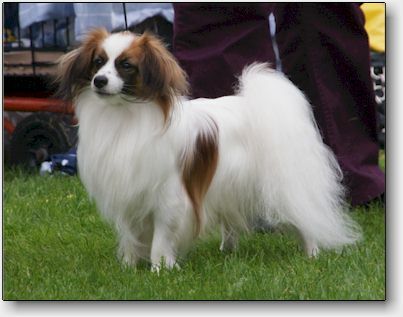 Out of two phalene groups and two papillon groups, she picked Blicci's phalene breeders group! Thank you so much! Congratulations to Bärbel Lieblich on the first win with Blicci's Golden Universe in puppy class, at the CACIB show in Nürnberg! The judge was Mr. Wilfred Peper. Max seems to be very nicely settled and happy in his new surroundings. Well done, Bärbel! 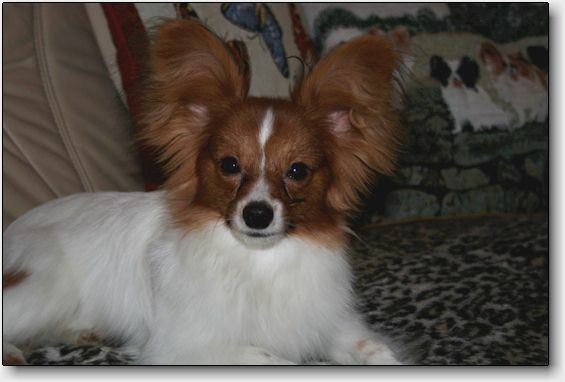 Blicci's Golden Universe, super stylish 6 months old son of MultiCh Blicci's U Are My Universe and DKCH SECH Lamonia's Evelina, has travelled to his new owner, Bärbel Lieblich, Papillons vom Cavalierchen in Germany. We wish Max the best of luck and look forward to following him and to seeing him again in the show ring. The photo is taken in his new home in the evening after arrival! Looks like he has settled well very quickly. 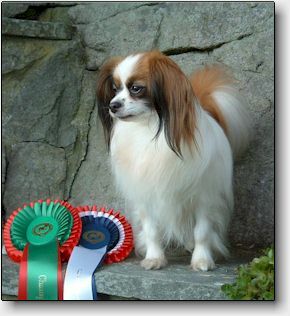 The litter brother of Max, Blicci's Ginzano, lives with Gabriella Lindbladh, Knasen's kennel in Sweden. Another guy who we look forward to seeing again.